Owen American built motor boat. 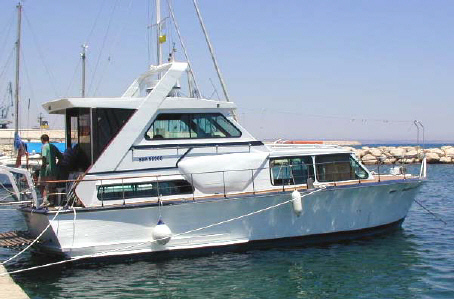 Large wheelhouse with sitting area and large table. There are also storage lockers under the seats. The saloon is very spacious with a nice sitting area that converts to a double bed. This connects to the large aft cabin which has one double birth and one single. There is also an en-suite head with shower. The forecabin has two single births and opening portholes. There is a second head just aft of the forecabin which has a chemical toilette. The main electric system is 12v but there are also 240v outlets. The large fridge works on 240v. There is also a pressurised freshwater system. A lot of work has been done on the boat recently. The engines have been fully serviced and a lot of parts changed, the generator has also been serviced recently, a substantial amount of money has been spent. The boat has been completely repainted outside and in.